CONTENTS 4) WOULD YOU LIKE FRIES WITH THAT? 13) DON'T WORRY, BE HAPPY! keeps in regular close contact with clients both past and potential, whether staying connected through e-mails, newsletters, mailers, and personal calls, or face-to-faceâ&#x20AC;&#x201D;taking a client to lunch at a restaurant in their new neighborhood or showcasing to a client all that Chicago has to offer. his or her home search online. 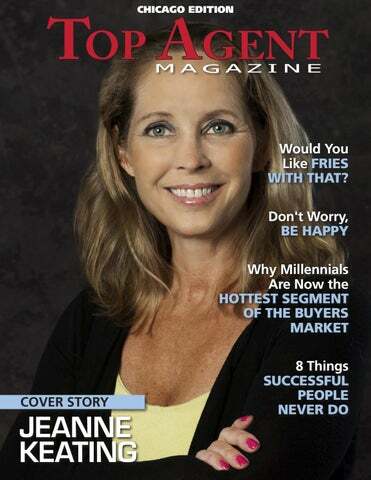 Jeanne also ensures that her work with potential buyers is considered and methodical, connecting with clients on a personal level and establishing trust, so that she can provide tailored and effective results no matter their ownership goals. 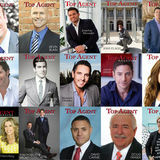 experience to a rising generation of agents. With decades of real estate experience from all angles, and an ethos fixed on client care and the delivery of results, the future is likely to usher in many more successes to come for Jeanne Keating. To learn more about Jeanne Keating visit jeanne.highrises.com, e-mail jeannekeating8851@gmail.com, or call (312) 671-5525 www. Dr. Peale asked George if he could spare some time to meet a large group of people who might have answers to George’s worries, since this was truly a worry free group. George, at his wits end grunted “sure.” After a long car ride to near the tip of Long Island, Dr. Peale had the taxicab stop in the middle of a large cemetery and the two men got out. likely to show you their good if they feel that availability from you. Don’t listen to T.V. or read internet news be•	Allow	yourself	to	risk. Enter en- fore you go to sleep at night. Count the ough. A friend of Nan’s had won the things for which you can be grateful grand prize on the American Chop- (full of greatness!) and sleep better. per contest. When asked how he won, he laughed and said, “When the con- •	Smile	more and hold eye contact test was announced, I ENTERED.” with others. Create a positive posYou’ve got to allow yourself to enter ture. Your positive physiology will the game and know that you aren’t be reflected by others and even if going to win every time, but you’re a you’re faking it, your forced smile, winner by playing and playing your eye contact and positive posture will best. Enter enough! If worrying about feel more natural and comfortable. losing stops you from entering, it Little shifts. guarantees a loss. Enter enough and you’ll find those places where you •	Delegate	responsibilities. Do what win. And as you enter enough, your you can, but let go of things before skills get better. Make up for lack of you become overwhelmed. If someskills, not by thinking about the lack, one else can do a task only 80% of but with enough activity. Show up... the way you would do it, but it gives you 100% of that time for another most don’t. taks which only YOU can do...you •	Focus	on	what	is	right,	the	good,	are 180% productive with that time. rather	than	on	what	is	wrong. So Life is too short. What parts are really much of the media focuses on the worth your attention? isolated disaster story. Happy stories don’t sell. Media stories appeal to •	Exercise/eat	well/sleep	well. Exthe lowest common denominator of ercise is a great idea even though our interests. Don’t go for the easy you may feel stressed about time and “take” or opinion of others. Consider other preoccupations. The endorthe possibilities. Have you ever had phins that reduce feelings of worry, your good intentions misread by fear, adrenaline production, also others? Allow the benefit of doubt by promote a more relaxed mind and seeing good in others. They are more body. As we grow older it’s inactivity be the best way to go. Slow down and focus. On the top of a full size piece of paper or, if you prefer, a digital memo app, write or type the words WORRY LIST. When a worry comes to mind, instead of letting it interrupt what you are doing, take out this list and jot down/type the worry. Keep doing this for one whole week. On Friday afternoon between the hours of 4:005:00 PM lock yourself up in a room •	Take	breaks. Short (10-15 minute) alone and take out your worry list. periods of meditation, stretching or Worry about everything on your list self hypnosis have been proven to for that full hour. So, you haven’t minimize mental fatigue, re-direct missed your self-made opportunity thinking to positive vision, and (choice) to worry, but you did it prompt productive, feelings of well under your conditions, and wasted a lot less time. being and energy. that will contribute most to pain and suffering. Do what’s right. Stay active. Cutting back on simple carbs allows the brain greater clarity. Good sleep patterns promote a healthier brain and better transmission of neurotransmitters (especially dopamine, serotonin and oxytocin -- happy! happy! happy!). •	Do	something	nice	for	at	least	one	someone	each	day. Go out of your way to make some else’s life a little better. Get out of your own head, just a little. Pass it forward. things, that success might happen a little quicker. Successful people plan everything. Not only do they have yearly goals, but weekly and sometimes daily ones as well. By giving your time a purpose, and a clearly defined goal, you’ll eliminate the time you spend haphazardly doing things that might not be a priority. It will also make you feel less scattered, which is always a good thing. Successful people take on what they can do well, and no more. That all starts with a daily ‘do to’ list. They always make sure their list is manageable and then they don’t sleep until that list is completed. If you find yourself not finishing your list, assess whether it was too much or if you slacked off. You’ll be surprised at the feeling of accomplishment you feel when you finish your list. Not finishing will bring you down, so make sure you aren’t biting off more than you can chew. Yes, having a strong work ethic is key, but that doesn’t mean you should waste time on things that will have less of an impact on your success. Focus on the things that will give you the most bang for your buck. Better to spend the majority of your time there, than spread yourself thin on numerous tasks. This might seem like a bad call in business, but successful people know when to cut your loses and move forward. Anything or anyone, that frustration into your life, is never a good thing. and moving on from mistakes. Yes, you learn from them, but don’t repeat them. Part of being innovative is trying new things, that will keep you fresh and energized, but learning how to let go is an equally important part of the equation. Successful people are in it for the long haul and therefore thinking long term. When you have a plan for success and the patience to see it through, while you might have a slow start, you’re establishing a foundation for long term success. Going for the easy fix, usually doesn’t pay off. Lets face it, we all have people in our lives who might be a little more pessimistic than is healthy to be around. You can’t change them, all you can do is not let them drag you down into their ‘glass half full’ mentality. Have your plans and goals, be confident about them. When you’re insecure, that’s when you’re most vulnerable to those types of people. That doesn’t mean letting go of things that aren’t working. It means having an end goal. Whatever obstacles or challenges come up, you take them on, always with that end goal in sight. Successful people know that adversity and overcoming those challenges, is how you grow, and will ultimately make you a better business person.